It’s Your Support That Helps Me Find My Happiness! I am Xu Jie. I joined this site and released my profile in December of 2009. As soon as my profile was released, I knew my current husband Terrance Bartsh. After that, we kept contact every day and we began to contact on telephone during the Spring Festival. He selected gifts for me by Chnlove every festival. In April, 2010, he came to meet me from the USA and my family and I picked him up at the airport, which made him feel warm. During his stay in China, we got on very well and we made a trip to Beijing. Two weeks passed very quickly. He told me that he would issue the visa for me as soon as he arrived home. I trusted in him and I prepared all the ducuments for the visa. Thanks to the help of the agency and translators, all the problem had beeen solved with their help. 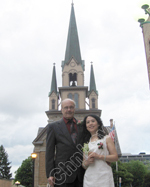 In October 2010, Terry came to China again and asked me to marry him. With the witness of my relatives and friends, we were engeged. Luckily, the visa was ratified in February of 2011 and I came to the USA at the end of Febuary. We got married in the USA and now we live happily. Here I want to expess my sincere gratitude to every member of the agency. It’s your support that help me find my happiness!